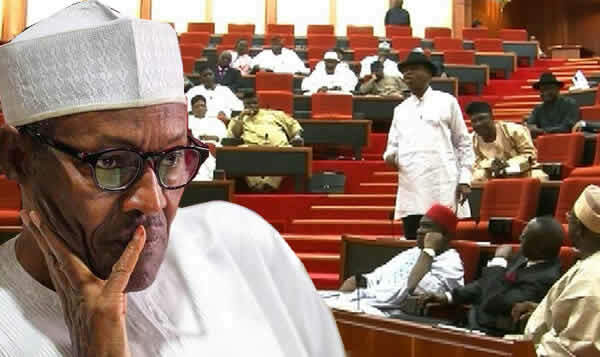 According to Premium Times, the claim by the Nigerian Senate that it did not discuss a proposal to impeach President Muhammadu Buhari at its executive session on Tuesday is false, further checks have shown. But extensive checks have shown that our upper lawmaking body is not saying the truth. Premium Times independently interviewed at least six senators who attended the session, and all of them confirmed that impeachment was discussed at the meeting. Those interviewed include those in support of embattled Senate President Bukola Saraki, and those opposed to him. They all asked not to be named so they are not punished for divulging details of discussions held behind closed-doors to journalists. One senator confirm it was Eyinnaya Abaribe (PDP-Abia) who tabled the proposal that Mr. Buhari should be removed from office. “It is time to go for the President’s jugular,” Mr. Abaribe reportedly said. When the Abia lawmaker was asked to further explain what he meant by going for the President’s jugular, the Senator said it had become clear that Mr. Buhari had no respect for the Senate and that the time had come for him to be impeached. Mr. Abaribe said the president was encouraging his subordinates to disrespect the upper chamber and that only two options were now open to the senate – go for the president’s jugular (impeachment) or continue to seek reconciliation that might not work. As Mr. Abaribe made his contribution, there was chorus of “yes, yes”, conveying approval by his colleagues, mostly PDP Senators. “But resistance came from us,” another senator said. With the resistance from APC Senators, the Senate descended into a rowdy session. Mr. Saraki then intervened to calm the Senators and restore normalcy . The Senate President reminded his colleagues that the issue at stake was not Mr. Buhari’s impeachment, but the actions to be taken on the Attorney-General of the Federation, Mr. Malami, who is prosecuting him and his deputy. Mr. Saraki was said to have argued that it was Mr. Malami who was being used to directly launch lethal offensives on the Senate and who should be subdued. Reached for comments on his suggestion for Mr. Buhari’s impeachment, Mr. Abaribe was evasive, neither denying nor confirming his proposal. He said he would only open up if names of the senators who divulged details of the meeting is disclosed to him.